Situated in Cesme, this hotel is 0.2 mi (0.3 km) from Pazaryeri Mosque and 2.2 mi (3.5 km) from Ilica Beach. Alaçatı Çarşı and Oasis Aquapark are also within 1 mi (2 km). Situated in the entertainment district, this luxury hotel is 0.2 mi (0.3 km) from Pazaryeri Mosque and 2.2 mi (3.6 km) from Ilica Beach. Alaçatı Çarşı and Oasis Aquapark are also within 1 mi (2 km). Nestled on the beach, this Cesme hotel is within 3 mi (5 km) of Alacati Marina, Delikli Koy, and Pazaryeri Mosque. Alaçatı Çarşı is 2.3 mi (3.7 km) away. Nestled on the beach, this Cesme hotel is within 3 mi (5 km) of Alacati Marina, Delikli Koy, and Pazaryeri Mosque. Ilica Beach and Alaçatı Çarşı are also within 6 mi (10 km). How Much is a Hotel Room in Alacati? Hotels in Alacati start at $35 per night. Prices and availability subject to change. Additional terms may apply. When you are trying to decide where your base will be while in Alacati, you will have a broad range of desirable possibilities. Our database is where you'll find 90 establishments within a 6-mile (10-kilometer) radius of the heart of Alacati. The Alaçati Kapari Otel - Special Class is a much sought-after Travelocity-listed hotel selection as it's so close to downtown Alacati. Budget travelers can breathe easy. Alacati features a good selection of low-cost establishments. The Alacati Zeytin Konak Hotel and the Alaçati Nüans Hotel- Guest House are another two lower priced hotels that are worth a look. You could also try the 7800 Cesme as well as the Sheraton Cesme Hotel, Resort & Spa. The 7800 Cesme can be found just 5 miles (8 kilometers) outside of the heart of Alacati. 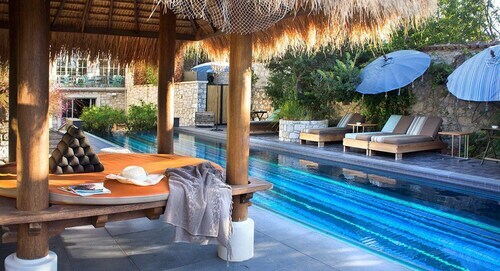 The Sheraton Cesme Hotel, Resort & Spa, is located just 3 miles (5 kilometers) away. 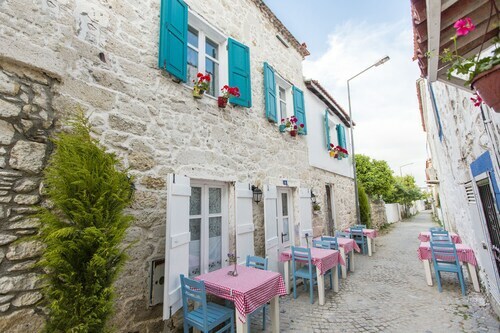 The Altin Yunus Cesme and also the Alkoclar Alacati are two other Travelocity-listed places to stay around Alacati. Once you have seen the sights in Alacati, be sure to check out Bodrum - Aegean Region's other scenic and cultural delights. View Bodrum - Aegean Region's beaches and coastal plains. You could also spend time at a selection of the area's castles. In this part of Turkey visitors can also take up the chance to partake in mountain climbing, hiking and caving. 4 miles (6 kilometers) away from Alacati, you'll reach Cesme, where you can enjoy Ilica Beach and Alacati Marina. Some of our recommended Cesme accommodation options include the Radisson Blu Resort & Spa, Cesme and Ilıca Hotel Spa & Wellness Thermal Resort. 35 miles (60 kilometers) east of Alacati, you will find Balcova, which features the Wyndham Grand Izmir Ozdilek and Kaya Izmir Thermal And Convention. Regardless of whether you're passing through or spending a few nights in Balcova, be sure to venture to the Agora Shopping Center and Kedi Culture and Arts Center. Chios Island National Airport can be found 14 miles (23 kilometers) from Alacati's central precinct. Wise visitors who hope to find accommodation in the area can easily book a room at the Chios Chandris Hotel or the Sea View Resorts & Spa.